The use of Laparoscopic Banding (Lap Band) as a restrictive bariatric procedure has been widely accepted and studied. However, many questions still remain for the correct stratification of patients for this procedure. Some absolute contraindications to a Lap Band include psychiatric problems or mental disabilities that will not allow patients to comply with appropriate post band diet and exercise program, malignant hyperphagia, and severe portal hypertension. Previous foregut surgery, older age (>65), severe cardiovascular and pulmonary disease, and a BMI >50 are some of the relative contraindications. We believe that there is also a subset of patients with hepatomegaly who may not be safe candidates for a Lap Band. We prospectively looked at all patients undergoing Lap Band placement at our institution over the last five years. We retrospectively analyzed the circumstances surrounding all patients who had aborted Lap Bands. All the patients underwent the standard preoperative work-up which included abdominal sonogram, Upper Gastrointestinal series/esophagogastroduadenoscopy, cardiac/pulmonary work up, a psychological evaluation, and lower extremity ultrasonography to evaluate the presence of DVT. The operative notes of all patients who had an aborted Lap Band were reviewed and the reason for aborting was noted. A total of 673 patients underwent laparoscopic bariatric procedures over the last 5 years. 221 Lap Bands were performed with the standard pre-operative work-up which did not show any contraindications. In 19 of these patients (9%) the case was aborted due to intraoperative findings. The mean age of the patients was 46 (20-67), 11 were male and 8 were female, average BMI was 48 (39-62). 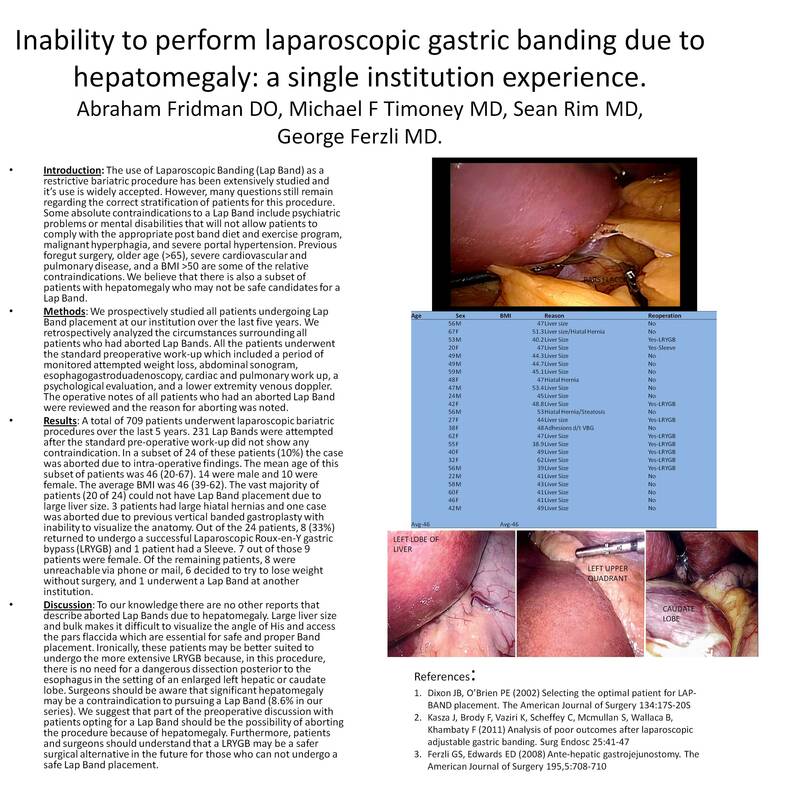 The vast majority of patients (15 of 19) could not have Lap Band placement due to large liver size. 3 patients had large hiatal hernias and one case was aborted due to previous vertical banded gastroplasty with inability to visualize the anatomy. Out of the 19 patients, 6 (31%) returned to undergo a successful Laparoscopic Roux-en-Y gastric bypass (LRYGB). 5 out of those 6 patients were female. Of the remaining patients 7 were contacted and they were either unreachable via phone or mail and the others chose non-surgical options. To our knowledge there are no other reports that describe aborted Lap Bands due to hepatomegaly. Hepatomegaly makes it difficult to visualize the window needed for Band placement which may make it unsafe. Ironically these patients may be better suited to undergo the more extensive LRYGB because in this procedure there is no need for a dangerous dissection posterior to the esophagus in the setting of an enlarged left hepatic or caudate lobe. Surgeons should be aware that significant hepatomegaly may be a contraindication to pursuing a Lap Band, 7% in our series. We suggest that part of the preoperative discussion with patients opting for a Lap Band should be the possibility of aborting the procedure because of hepatomegaly. Furthermore patients and surgeons should understand that a LRYGB may be a safe surgical alternative in the future for those who can not undergo a safe Lap Band placement.